As we approach the 35th Anniversary of Toronto Maple Leaf, Darryl Sittler’s NHL record of 10 points in one game we are also at the 60th anniversary of the Lethbridge Maple Leaf, Stan Obodiac’s 10 point game. But what’s the connection besides both playing for teams called the Maple Leafs? 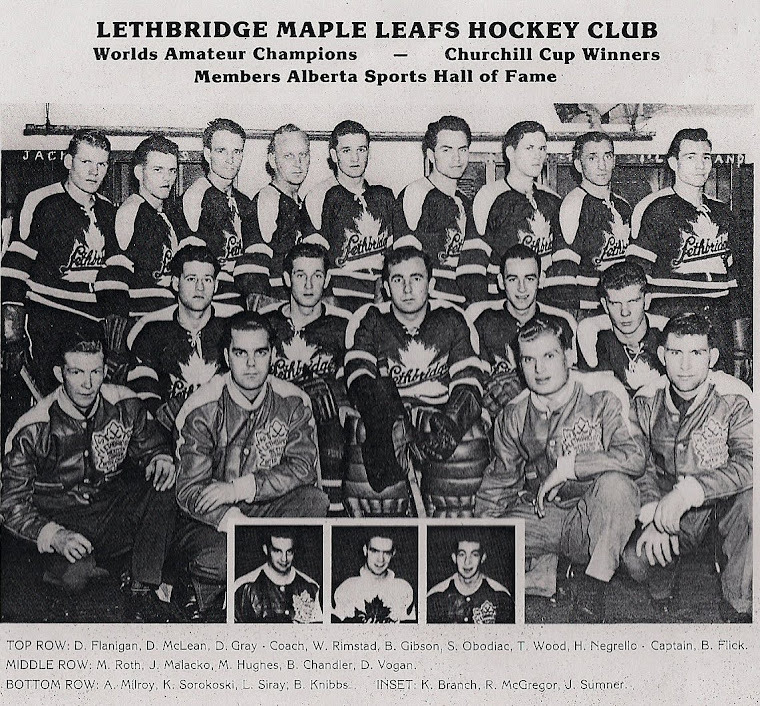 Stan Obodiac was the top scorer in the Lethbridge Maple Leafs' 1951 European Tour and World Championship Victory. He scored 10 points in one of those games! See more about Stan Obodiac. His sweater from the series is in the Hockey Hall of Fame. He became the Public Relations Director and Statistician for the Toronto Maple Leafs. When Sittler had 7 points after the second period in his historic game, it was Stan Obodiac who entered the Toronto Maple Leaf dressing room and asked Sittler if he knew that he was just one point shy of Rocket Richard's record of 8 points in a game. Sittler went out and scored 3 points in the 3rd period to establish a record of 10 points in one game. Stan Obodiac must have had a flashback to that night in 1951 when he also scored 10 points in one game! See the interview with Darryl Sittler in which he talks of the record and Obodiac.